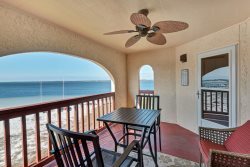 LUXURY GULF FRONT CONDO ON NAVARRE BEACH! "Beachy Keen" is a beautiful 2 bedroom, 2 bath Gulf front condo that offers traditional island-inspired decor, tile floors, large fully equipped kitchen, open floor plan, comfortable living room with large TV, a king bed in the master bedroom, 2 twin beds in the second bedroom, queen sleeper sofa in the living room, wireless internet, TV's in each bedroom and a covered private balcony with views of Navarre Beach and the Gulf of Mexico. Beach Colony Resort on Navarre Beach is a beautiful Gulf front property and offers many amenities such as having the largest resort swimming pool on the beach, BBQ Grills, a tennis court and a fitness center that is all available for guests to use. Beach Colony Resort is the perfect family vacation destination! This unit does not allow long term rentals. Navarre team was very easy & friendly to work with. Happy to help in any way. We were very pleased with our stay. Our Unit was very nice, spacious, clean, and the Kitchen was well equiped. The views were gorgeous. Everything was exactly as described in the online information & pictures. They were polite and friendly. Easy to check in and apologetic when our unit wasnt ready before check in. Overall a good experience. I really enjoyed the coded door entry. Much easier than coordinating keys with 6 people in our unit. I would stay here again and may stay next summer. Pool and grilling area are nice. Elevators, entry area and covered parking are very convenient. It was easy for my teenagers to come and go and visit friends on a different floor. Thank you all for making out stay so enjoyable. We'll definitely be back to Navarre Beach! It felt like home: clean, beautifully decorated, comfortable beds. Very pleased with this property and would definitely stay here again. We will be back and will be requesting this same property again! Never had 1 issue while staying in Navarre. It's the prettiest beach on the gulf coast and my family and I will keep coming back year after year. Excellent the gal we spoke to about unit options for our timeframe sent great options and links. Late checkin a breeze and easy to use. Liked the security feature on elevator codes and few units on each floor made it quiet. We really enjoyed the break from retirement. Too busy at home so this was nice early spring break. Nice no major spring breakers at Navarre. Enjoyed it all and parking garage great and close to use car for beach item storage.